What will it take to set them free? Dreams, ambitions, pleasures, plans, obsessions and fears. For Diane, Nancy and friends, leaving Edinburgh University in the mid-1970s, such attachments initially serve them well. Heading out from Dalmeny Street to England, Ireland, Wales, America and the Middle East, their very different lives intertwine and paths often cross. But as 40 looms, the going gets tougher. The old attachments tighten their grip and their lives start to shake and unravel - with devastating consequences for some of the group. Eventually each woman is forced to confront her own reality; some with insight, others not. Is there a different and better road ahead? Is there still time to rescue their lives? ‘Eight of Cups’ is a genuine page-turning novel; an entertaining yet bitter-sweet story that asks serious questions about the potential for attachments to smash our hopes of becoming all we can be. If you like reading Rosie Thomas, Joanna Trollope or Elizabeth Noble then you’ll love ‘Eight of Cups’! Meet the ‘Dalmeny Street Girls’, in the gripping contemporary saga that reviewers and readers describe as "a compulsive read”, “the perfect blend of humour and real-life drama”, “compelling”. 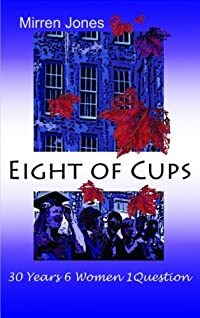 If you enjoy well-written Women’s Contemporary Fiction that has the power to make you laugh and cry, download a sample or buy Eight of Cups now!